The baton-equipped guard patrolling the gallery was only one of many hints that Made in Palestine would not be your average gallery exhibition. Even before the traveling show made its first scheduled stop in San Francisco, the reviews were in: Two county officials in Westchester, New York, denounced it as “art that glorifies terrorism,” and the San Jose Museum of Art declined to host the show on the grounds that it was “too polemical and might offend our audience.” Made in Palestine was cited in the pages of Mother Jones as evidence of how difficult it is “to speak openly in America about the Palestinian plight” (May 11, 2005), and alternatively in the San Francisco Chronicle as an event that “actually brought Jews and Palestinians together in a positive way, in a face-to-face manner that may have humanized both parties” (April 3, 2005). This background leaves one rather important question unanswered: How was the art? To read accounts of the show, you’d think the gallerists had forgotten to switch the lights on. The newsworthy story of the curators’ efforts to find a gallery willing to exhibit Made in Palestine after its 2003 premiere at the Station Museum in Houston, Texas (where it was extended, receiving some 20,000 visitors in all), has overshadowed the actual art. This is a shame, because the ability of the work to make itself heard over the furor surrounding it is an important artistic achievement. 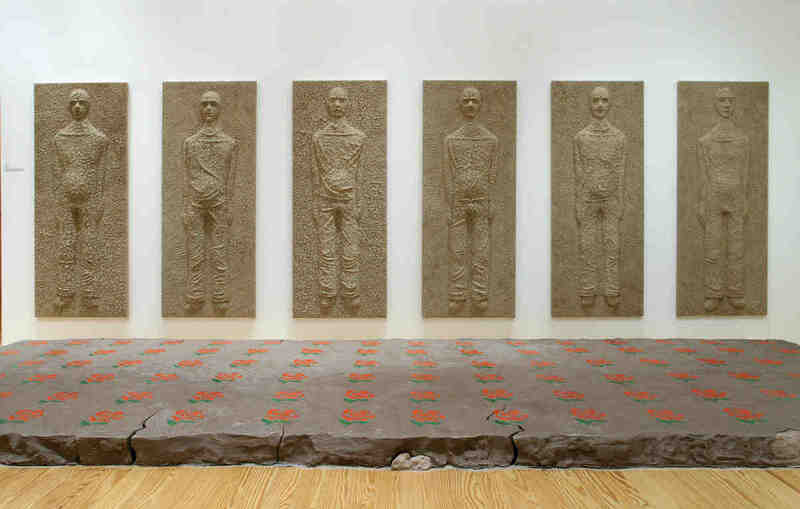 Given the advance publicity, you might expect Made in Palestine to cause a commotion along the lines of the 1998 Saatchi Sensation show, which launched a generation of young British artists who are largely admired or reviled on principle rather than on the merits of their artwork. But there’s nothing particularly shocking or polarizing about Made in Palestine; to the artists’ credit, the strongest works are also the most subtle, interactive and reflective. Any account of Made in Palestine — and it could be argued, contemporary Palestinian art — should rightly begin with the work of Suleiman Mansour. In the 1980s, Mansour’s social realist painting of a hunched Palestinian carrying the weight of Jerusalem on his shoulders drew comparisons to Mexican muralists Diego Rivera and David Alfaro Siqueiros — and like these dissident muralists, Mansour was subject to censorship and arrest for the political content of his work. Back in the days before the first Intifada, Mansour’s posters were dealt clandestinely out of the back of newsstands in the Old City of Jerusalem. So the monumental Mansour installation greeting the viewer upon entry to Made in Palestine is a shock to the system in more ways than one. I, Ismael is a wall of towering cracked-earth sentinels, a tribute to the Biblical ancestor of the Palestinian people. What’s new here isn’t the content; for decades, Mansour has depicted silent witnesses to a land, a history and a people in an obvious state of distress. Instead, it’s the surprising scale and nuanced, abstracted style of the figures that makes Mansour’s mud seem fresh. The disarming grandeur of this earth work makes preemptory critiques of Made in Palestine seem embarrassingly petty; in fact, any mud-slinging only serves to make this silent monument to persistence all the more relevant. Of course, the strongest visual association most American viewers have with Palestine is probably documentary photographs of Palestinian uprising. Rather than dissociating themselves from these mass-mediated images, several artists in Made in Palestine have incorporated documentary material in unexpected, elucidating ways. Rula Halawani’s Negative Incursion shows familiar scenes of occupation — tanks, roadblocks, demolition, funerals — in the negative, as though the photographs and the conflict we’re seeing are developing before our very eyes. Here Halawani offers us not perspective, but X-ray vision: It’s as though we’re looking right through to the core of the conflict, to its very bones. Like a doctor breaking bad news, Halawani suggests that unless the chronic condition depicted in these images can be alleviated, the prognosis does not look promising. Rana Bishara’s Blindfolded History is a maze of documentary images printed in dark chocolate on fifty-seven glass panels — one for each year of occupation — hanging in precarious balance from gossamer monofilament. The dark, clotted chocolate images on the transparent panes bring to mind blood and domesticity, clarity and nostalgia; seen together, these flat surfaces become a multifaceted work that speaks volumes. Yet despite Halawani and Bishara’s admirable efforts to provide coherence to documentary footage, their work can provide only an episodic, disjointed account of history in comparison to epic installations by Mustafa Al Hallaj, Mary Tuma, and Emily Jacir. Like Bishara’s work, Al Hallaj’s massive installation of mythical drawings, Self-Portrait as God, the Devil, and Man, commemorates major events in Palestinian history — only this time, it’s personal. As the title indicates, Al Hallaj casts himself in both heroic and antiheroic roles, so that sometimes he seems to be at odds with destiny, history and even himself. Yet he reappears in panel after panel, swept along through tumultuous events like a tragicomic Shakespearean jester whose main role, it turns out, is to live to tell the tale. For all the women whose tales have yet to be told, Tuma created Homes for the Disembodied, a row of four long black thobes that dangle in the air like so many unspoken words. These dramatic dresses are cut from a single piece of cloth 48 meters long in order to give a sense of the continuum of women’s history, even as they mark the 1948 expulsion known by Palestinians as the Nakba, or Catastrophe. Emily Jacir has also chosen 1948 as her literal and metaphorical point of departure in Memorial to 418 Palestinian Villages which were Destroyed, Depopulated, and Occupied by Israel in 1948. Jacir stenciled the names of the villages onto an UNRWA-issue refugee tent, then invited Palestinian and Israeli residents from these locations to help her embroider the place names onto the tent. Where architects have failed in marble and bronze, Jacir and her volunteers succeeded with only a needle and thread in making a memorial that makes new memories seem possible. But perhaps the most indelible work in Made in Palestine was Tayseer Barakat’s Father, which at first appeared to be nothing more than an unassuming wooden file cabinet. Only when the visitor takes the initiative to open the cabinet does a deeply personal story begin to unfold: Inside each drawer, a day in the life of artist’s father has been scorched into the wood. Barakat shows how a human life can seem eminently dispensable, just a part of the furniture in the halls of power; and yet if we choose to look at it closely, that life becomes etched in our minds. This is a work with the evocative power not just to record history, but to make it — and more than generating headlines or momentary sensations, this is the tantalizing promise of this show in particular, and art in general.